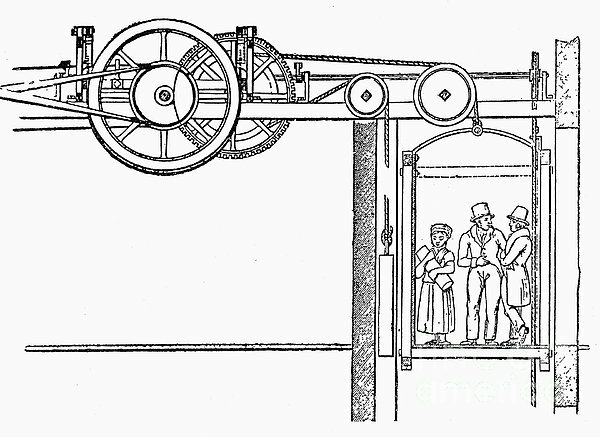 In 1823 Thomas Hornor built the first powered elevator he called the “Ascending Room”. 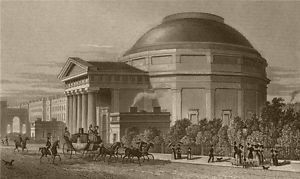 Hornor opened his London Colosseum, designed by Decimus Burton, to the public on 10th January 1829 with it's lift to take tourists up to a platform to view the London skyline. Decimus Burton was an architect known for London Wellington Arch and Hornor was a panoramist surveyor and inventor. Born on 12 June 1785 into the Quaker family of a grocer in Kingston upon Hull Yorkshire. Hornor (or Horner 12/6/1785–14/3/1844) learned surveying and engineering from his brother-in-law. He conjured up an elaborate scheme to create a 360 degree panorama view of London on the inside of a dome of his Colosseum specially built in Regents Park resembling the Roman Pantheon. Inside the Colosseum was a steam-powered "Ascending Room" capable of elevating up to twelve persons and was raised by "secret machinery". The project proved so expensive that his backer, Rowland Stephenson MP, had to flee to America in 1828, Hornor fled soon after settling in New York around 1829 where Elisha Otis lived. He died in penury (extreme poverty) in 1844. The Colosseum was demolished in 1874 after being visited by over 1 million people! 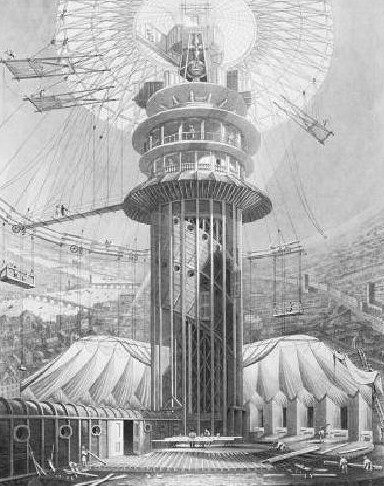 Next came the “Teagle”, a steam driven lift, which was built by two architects in 1835. English architects Stutt and Frost built the Teagle to have a belt and a counterweight for safety. A control cable in the car operated a belt-shifter to change travel direction. A hand brake is in evidence. This basic system remained the principle for lifts for over 50 years.